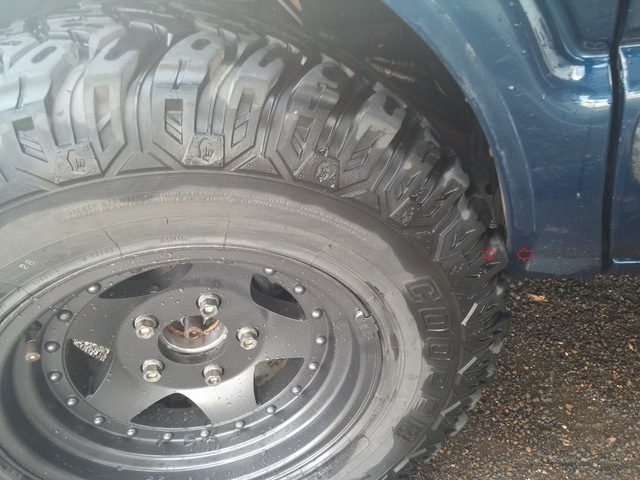 My 30x9.5R15 Cooper Discoverer STT's are rubbing at full turn shown in the 2nd pic. So I need some advise here. I already pulled the chrome fender liners off to give it a tad more room and to keep them from getting destroyed but i still need more clearance and I don't want to trim anything so here's my question. 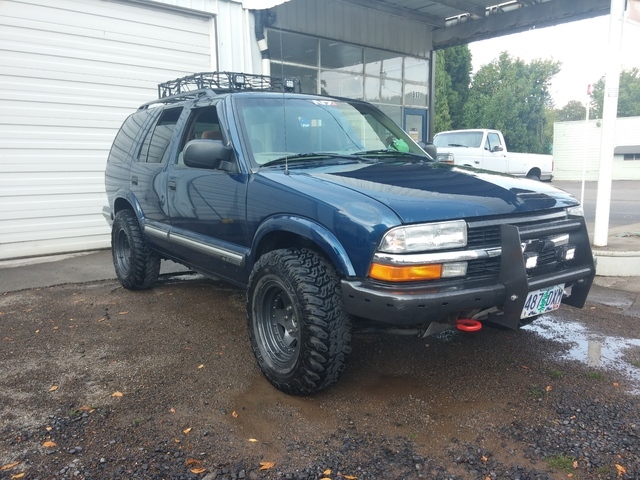 Is there and part of the Rough Country 2.5" Suspension lift that would prevent me from also doing a 1" torsion crank and 1" shackles as well? Here's a couple pics and if you have general questions about my Blazer shoot! BTW, she's got 234,000 miles on the original motor and transmission! Last edited by JasonB503; 07-13-2015 at 08:33 PM. 30 in tires will fit with no lift, or at least on mine they do! Your problem seems to be not enough back space. Get that right and your hub bearings will thank you, not to mention what it wont do to your scrub radius. Get the tortion bars within the correct "Z" dimention and your CV joints will last longer as well as your ride quality ride quality wont take a hit. To be honest, I don't see 1" helping too much with that stance. You might want to look into a body lift. They're about $200. It definitely cost's more than a pair of shackles, but after the shackles and paying for the alignment you'll be looking at around the same cost. And your blazer looks amazing by the way! What wheels are those? I really like the look of them! Yuo can un bolt the inner fender well there and then cut the fender with a sawz all then re attach the fender well. Thats what most of us do. Or a 2 in body lift would help also. I like those wheels. unfortunately by losing that much back spacing you are going to put tremendous stress on your ball joints, even more so if you crank the torsion bars. I like the weels too, they would look really good with stainless rivits! Unfortunately they prolly wont work. They might work with an eleven inch lift and a hatchet to the fenders, but I think it is just better to get the correct backspace. 2" body lift would definitely be more effective, but might still not be enough. But to answer your question, the RC 2.5" lift comes with it's own shackles so you would be out the money for the first shackles. The Tbar crank won't affect anything, but you won't be gaining an additional 2.5" lift on top of the crank. You would gain an addition 1.5"
Thanks for the advise so far guys. Im not sure what brand the wheels are at all. A customer at my shop gave them to me in exchange for mounting and balancing a few tires. 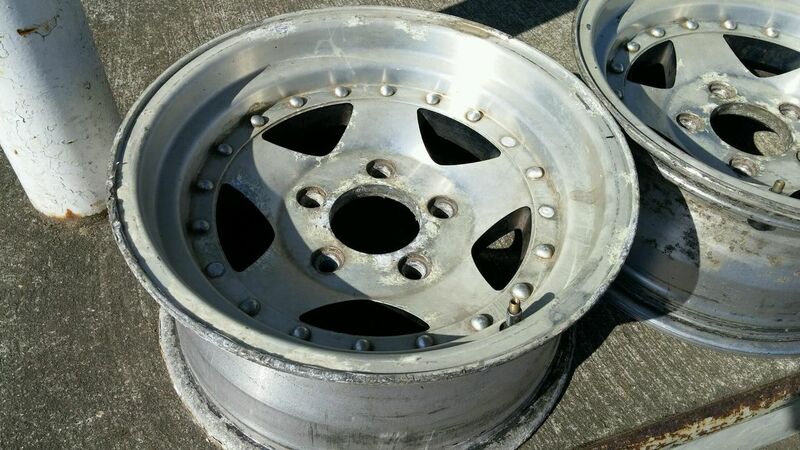 The rims had been sitting in his yard for years and were pretty bad looking. Some sand blasting and paint turned that around. I think ive come to the conclusion that 1" wont be enough like lazyboyjake mentioned. Also, i cant seem to find shackles or add-a-leaf sets that only add an inch to the back. they all add 1.5-2" so that kinda forces me to do the same in the front or itll look stupid. Last edited by JasonB503; 07-19-2015 at 02:22 AM. but it would also help to know how you're going to use your blazer. street only or playing off road at all? street only, cranking might be enough to get you clear of the tires.